How many WIPs do you have? Really now, dig down in all of your hidden totes, stashes, behind your couch, in your deep freeze (yes, deep freeze) etc., drag them out, and count them. I did this, and even TOOK PHOTOS. Here is what I will admit to, from the newest to the oldest projects. bought in a frenzy power shop when I was in Providence for Carson’s graduation while my husband was waiting in the car while I ran in for “hand cream”. That is souvenir yarn. Also the yarn (ahhhhhhh cashmere! )I bought in Italy. Souvenir yarn again. It is also could be considered in the category of “decorations” for the living room. If it never gets knitted, that is OK.
into the “Lucky” pattern so it also was frogged. The are queued up now for socks, in the on-deck basket. This scarf was started Summer 07 in two colors of Jitterbug. It will take forever t finish. designed by a fellow Camp Crow’s Feet sock camper, Linda Welch. I will show more photos of them as they progress. They will be a fast knit. Uh, er, it is now in the time out corner. It is Wildfoote yarn by Brown Sheep. I am spoiled and hooked on Sock That Rock. This just doesn’t measure up. This is a nursing shawl that I just finished for Aimee. It is a 50-50 wool-cotton blend. Not too wide, not too narrow. 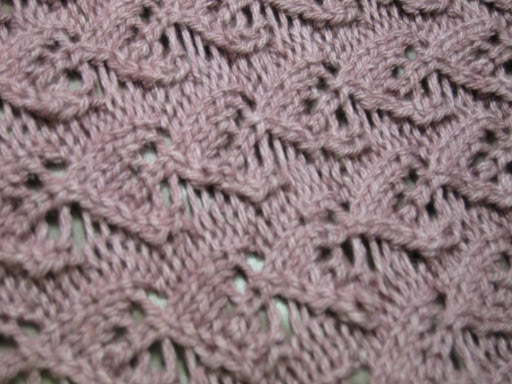 Even though each row was charted, it was an easy-ish knit. Amazing how these all look better here than in my bag at the foot of my chair. These socks are in Cascade Fixation and for my mom. 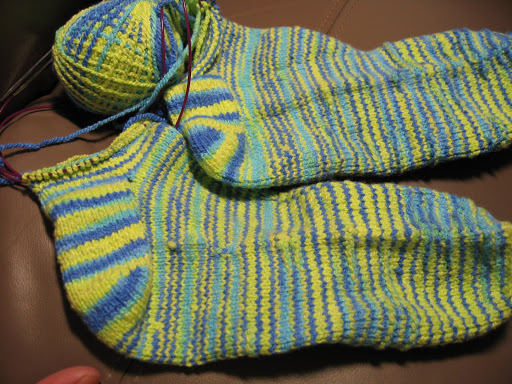 They are Cat Bordhi’s Sky sockitecture, and they are almost done!!!Wooo-hooo!!! 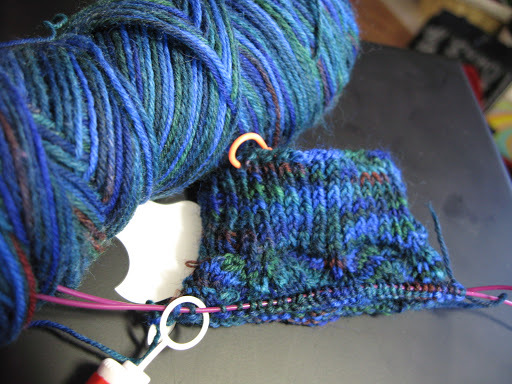 Ahhh, and behold the Monkey KawKaw sock in progress. nd here. Hence, they have become “the Monkey KawKaw” socks. They are now done! Woo Hoo! Alpaca With a Twist. It is a modular design, you never cut the yarn. Only problem now is that it was so long ago that I was knitting on it, I will probably have a hard time figuring out how to start up again. This is an alpaca shawl that I started summer of 07. It is from Blue Sky Alpacas. All it needs to be finished is a picot edging that is picked up and knitted all around. I don’t know why I haven’t actually finished it. I’m just not that into it. It was abandoned. 😦 Poor little alpaca shawl (sniff, sniff). Another view of the Colinette Jitterbug scarf. Oh, it is soo short. Why doesn’t the knitting fairy finish it at night for me??????? This is a front of a modular sweater that I started so long ago. I’m not even sure HOW long ago. Maybe 3 years? I actually have the fronts and back done, had it all together and knitted some sleeves, but they just didn’t work. So I ripped it apart. I have some pewter buttons I found for it somewhere in my travels. I know that one morning I will just wakeup and pick it up and finished within a couple of days. 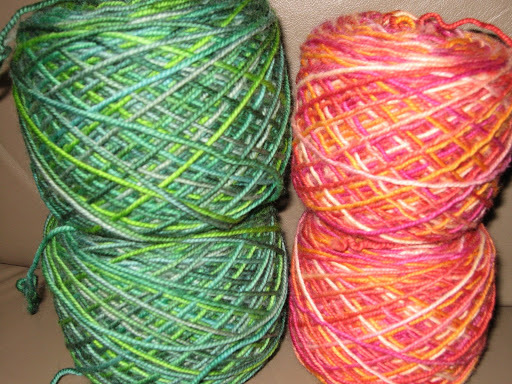 There are just so many other yarns calling my name, though. This unfortunately isn’t the end of the list. However, this is about all that this computer program will allow me to post though. Yes, there are still a couple that are older than this (grin). I will put them in another post.